"CLASSIC BOATS ARE ALL THE RAGE"
Few things are more striking than a classic boat sitting at dockside or gliding across the water. Most boaters walking along a dock will stop to admire a classic recognizing the beauty of a well kept old boat. Most classic boats are those hand-crafted of wood. Older steel hulled vessels can be considered classics and some fiberglass vessels are reaching an age where they too can join the ranks of classic boats. It must be noted, the beauty of an old steel or fiberglass classic is found in the trim – which is most often - wood. Wood, be it trim or the entire vessel, is very costly and time consuming to maintain. The pleasure of hearing comments from observers though is very rewarding and provides incentive to continue the upkeep. I know this to be true because I have restored, maintained and enjoyed pleasure cruising and working aboard eight classic vessels. As the father of four girls, I was fortunate they each realized the pride of owning a beautiful classic. They also understood the tender care required to distinguish a classic from just another boat. As they grew up, all of them chipped in and helped maintain our boats. The girls could often be found perched on the bow at dockside waiting to talk boats with admirers. Like many owners of old classic craft, they would announce, “That’s teak you know,” and go on to explain the maintenance required to keep the boat looking so good. 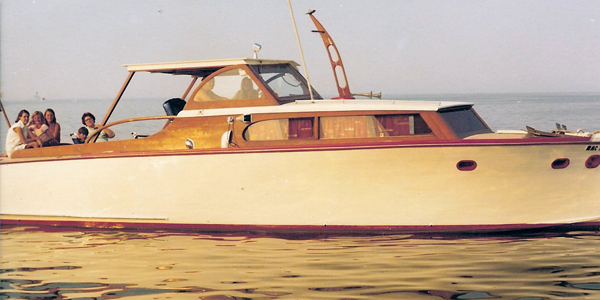 Classic boat ownership is exploding all over the country. There are hundreds of clubs such as, “The Antique and Classic Boat Society, Inc.” This group numbers over 12,000 members and the Chris Craft Club, representing only one craft, has 3,000 members. Just like classic car owners, they love to gather to show off and talk about their boats. There are hundreds of Classic Boat Shows held each year from coast to coast. The shows bring people together from all over the U.S. to socialize with other like-minded boaters. They discuss their boat restoration projects and locate needed boat parts. Restoration, upholstery and hardware shop owners follow the circuit to market their products. Most of the shows are in-water and have limited space so registering well in advance is a good plan. If you wish to check out the various shows, all you need do is type into your browser, www.antiqueboatshows.com to find them. The Heartland host several, a few are; Blue Ridge in Chapin, South Carolina, Beaver Lake show in Arkansas, Lake Greenwood South Carolina hosts several and Queen’s Landing in Mooresville, North Carolina has an annual show. During my years of salvage work on the Great Lakes, I encountered many boaters who purchased old crafts they considered classics. Most of them were shocked to learn they were not sea worthy after getting underway and some of them put lives at risk while cruising aboard them. The old wood hulls do not take kindly to grounding and after salvage recovery were usually declared total losses. Be cautious when purchasing an antique boat. Unless you are very knowledgeable about wood as well as old marine engines, you need to consult a good marine surveyor. Try to locate one that specializes in antique boats because most of the antique vessels are wood and dry rot is commonly found in them – if you know where to look. Surveyors are very capable of detecting it even if attempts are made to cover it up. Another person to take along when shopping for an antique boat would be someone skilled at restoration of wooden craft. If you do make a good selection and wish to finance the boat, very few lenders are available to support your choice. In 2006, Essex Credit, a wholly owned subsidiary of Bank of the West, launched a national financing program for collectors of antique and classic runabouts and cruisers. On their website (www.essexcredit.com ) they claim, “After researching the specialized needs of this niche market, we want to be the first lender to offer a program to serve it. We will finance boats dated from 1919 to 1969 and are located in all 50 states and Puerto Rico.” Visit their website for current information on the company. Other lenders may wish to offer loans for the antique vessels; I suggest contacting some of the classic boat organizations for assistance. I was once asked if antique boats are considered investments. Like any asset, its value may increase over time but only if it receives excellent, tender care. I consider any boat an investment. My experience with the older vessels I restored resulted in all of them maintaining their value and some gaining value over the years. Insuring a classic boat can be challenging. The insurance company I did business with was familiar with my experience and habit of maintaining my vessels so I was always able to obtain coverage. On it’s website’s home page (www.hagerty.com/marine ) Hagerty Insurance Company leads with, “Classic Boats Deserve Classic Coverage” and continues saying; “We were the first – and best to offer Agreed Value Insurance for classic and wooden boats.” The company also insures classic cars and offers financing for cars and boats. Like insuring anything, there are qualifiers to be met, some say a boat must be 40 years old to be called an antique. As I was researching for my article, I received an intriguing communiqué from an associate regarding a new boat company just launched, American Beauty Boats. The message contained a press release dated June 12, 2009 from Oxnard, California. In it I learned the boats are powered by an air-cooled motor that charges fully overnight using a maintenance-free battery system. There are two models debuting; The Cabriolet, with rear steering and the Gatsby with front steering. My advice to all those interested in antique, classic boats is to vacation at one of the popular areas such as the Finger Lakes in New York and soak up the atmosphere of the old woodies.